Pope Benedict XVI has warned of an "aggressive anti-clericalism" in Spain which he said was akin to that experienced during the 1930s. He arrived in the pilgrimage city of Santiago de Compostela at the beginning of a two-day visit to Spain. "The clash between faith and modernity is happening again, and it is very strong today," he told reporters on the plane, quoted by AFP news agency. He is due to celebrate an open-air Mass and then travel to Barcelona on Sunday. 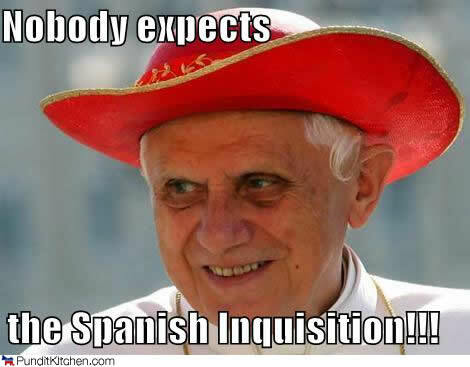 "Spain saw in the 1930s the birth of a strong and aggressive anti-clericalism," Pope Benedict said. He urged a "meeting between faith and secularism and not a confrontation" in Spain and the rest of Europe. In a speech in Spanish in Santiago de Compostela, he called for "a Spain and Europe concerned not only with people's material needs but also with their moral and social, spiritual and religious needs, since all these are genuine requirements of our common humanity".